Aroldis Chapman made his debut on Aug. 31, but what's the big deal? Many guys are showing up around this time (but interesting that the Red called him up before Sept., eh?). Chapman’s cards have doing well on the secondary market since he was called. A 2010 Bowman Chrome red refractor /5 BGS 9.5 sold for $1,775 (link ) and a red raw refractor sold for $900 (link ). the big deal is the the 22-year-old flat out throws heat. In his two Major-League innings (yes, just two), he has done enough that his cards have spiked on eBay. A simple search of his name yields more than 1,400 auctions. In those two amazing innings, the Cuban-born pitcher struck out three guys and has yet to allow a runner. But that doesn’t matter. What everyone is talking about is the speed gun. 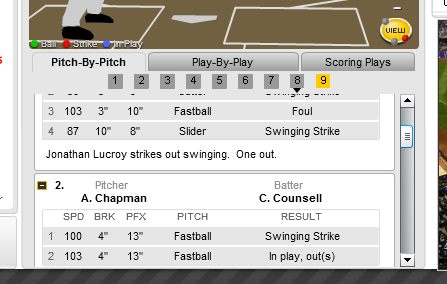 Chapman hit 103 mph in his debut and apparently hit 105 before that in the minors. Which card of his would you rather have?